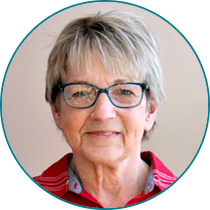 Meet Joyce, a courier volunteer at Hospice of the Red River Valley. Courier volunteers pick up and deliver supplies and medications to hospice patients. Tell us why you choose to volunteer with Hospice of the Red River Valley. I chose to volunteer for Hospice because they were very helpful with my husband, who they cared for. I wanted to give back to Hospice of the Red River Valley the way they gave to us. Patients and families are very grateful towards me when I deliver supplies to their homes or facilities. Sometimes they mistake me for a nurse, which always make me chuckle. I feel that the patients and families are very appreciative of hospice services. Go for it! Volunteering for Hospice is very flexible, and I enjoy working with everyone. Hospice staff has been so nice to me. My grandkids and my family.